I always appreciate large monitors. 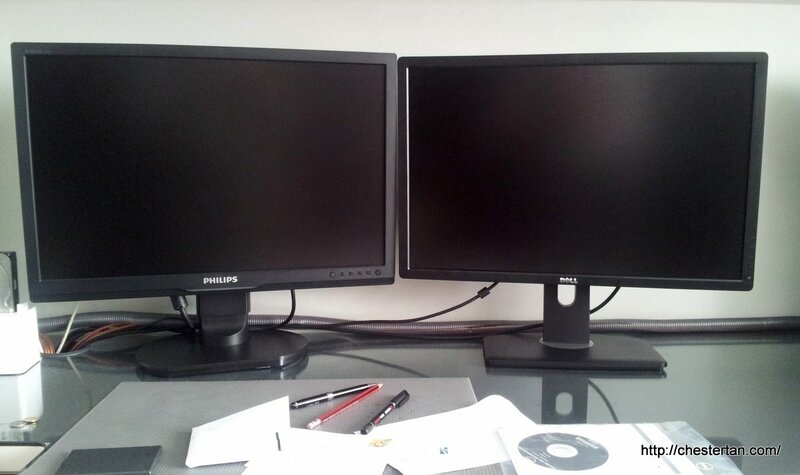 I myself have 2 monitors which are set up side-by-side for extended display, allowing me to see more windows. I don’t quite understand why many of my co-workers have no interest in enjoying the benefit, even though our office has quite a handful of monitors lying around since the desktop era (one colleague from another division did let in that he didn’t want his co-workers to see what he was doing on his computer). 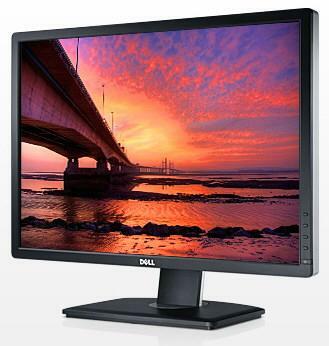 I recently received a review unit of the Dell UltraSharp U2412M monitor. This is a new 24-inch LED monitor with E-IPS (enhanced In-Plane Switching) panel, a superior display tecnology compared to the more common TN display. IPS panels produces more accurate colours and offers wider angle of view without colour distortion, a characteristics common with LCD monitors. The U2412M is priced lower than the U2410 as it is powered by the more energy-saving LED and has less connection ports. To make room for the Dell U2412M at home for the review, I removed my other 21-inch monitor and connected the Dell unit. The Dell U2412M is so easy to remove from the box. There is a groove for me to pull the styrofoam out from the box, like a drawer. The stand is so easy to fix onto the display panel. The 2 items lock into place with ease, and it is even easier to detach them via a large spring button. Adjusting the position of the monitor is just as easy, thanks to the well-designed stand. Apart from height adjustment, it allows me to tilt, swivel and pivot the monitor, and the mechanism feels smooth and effortless. The stand even lets me tilt 90-degrees to portrait position. Left, Philips 240B. Right, Dell U2412M. 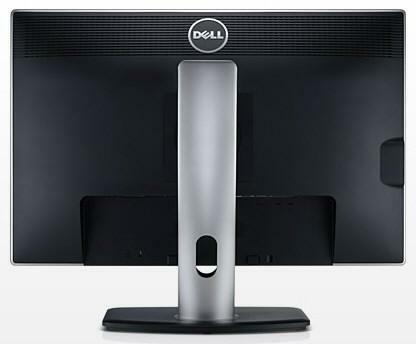 Getting the monitor to work straight from the box takes less than 5 minutes and uses even less muscle – the Dell U2412M is pretty light for its size. Once plugged in, my Windows 7 OS effortlessly detected the monitor and auto-configured to display the native resolution. Unlike the more expensive siblings, the U2412M does not ship with calibrated display. When compared visually with my TN-panel Philips monitor, the E-IPS pannel Dell monitor does not appear to show any pronounced advantages. But when I ran it through some monitor testing tools, the benefits of E-IPS panels immediately show. The U2412M indeed offers better colour accuracy at all viewing angles. I like the 1920×1200 resolution of the Dell U2412M instead of the more common 1920×1080 “HD” resolution, because it is less “widescreen”, a format for movie viewing but not so for content browsing. If you set up the monitor in portrait orientation, you effectively have more than double the screen resolution of 2 sets of 1280×720 monitors! Dell U2412M (right) in vertical orientation. I see more of Facebook in a single page! Above, you may observe that I am editing my photos on Lightroom with my left screen while opening a full-screen Facebook page on the right. I find that such a setup makes my computing work a lot more effective. The Dell U2412M offers the convenience of preset modes to give you better display experience depending on the content you are viewing. There is the Standard, Multimedia, Movie, Game, Text modes. I like how the On-screen display (OSD) button indicators are aligned right next to the physical buttons so that I know exactly which button to press. On most monitors, the OSD would display the actions next to the icons and I would have to match the physical buttons in order to invoke the action. I also like that the Dell U2412M comes with 4 USB ports which you can plug your peripherals to (my Philips 240B only has one). Display connectivity ports that the U2412M support include VGA, DVI-D and DisplayPort. A DC power connector lets you power an optional Dell soundbar conveniently. Like almost every great gadgets I reviewed, the Dell U2412M attracts me with the highly functional stand and E-IPS panel that produces accurate colours at all angles. For the environmentally conscious, the U2412M uses less power thanks to its LED backlight and built-in energy-management features. Getting the monitor to work from the box is so easy, unlike all the previous monitors I purchased. I will definitely consider this monitor for purchase – once my other 21-inch monitor breaks down – as it matches the size of my current 24-inch monitor for a seamless dual display setup. Plus, it offers me display flexibility thanks to the ability to rotate 90-degrees. Nice Review, there are many reviews and blogs about this Dell Ultrasharp u2412, because of its uniqueness and special features, and it is most purchased monitor nowadays.